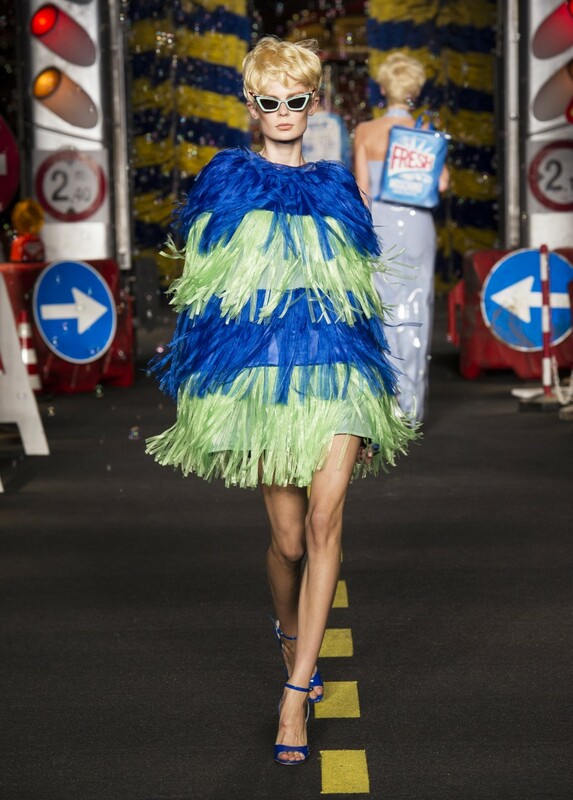 Was that Big Bird making his runway debut in Milano? 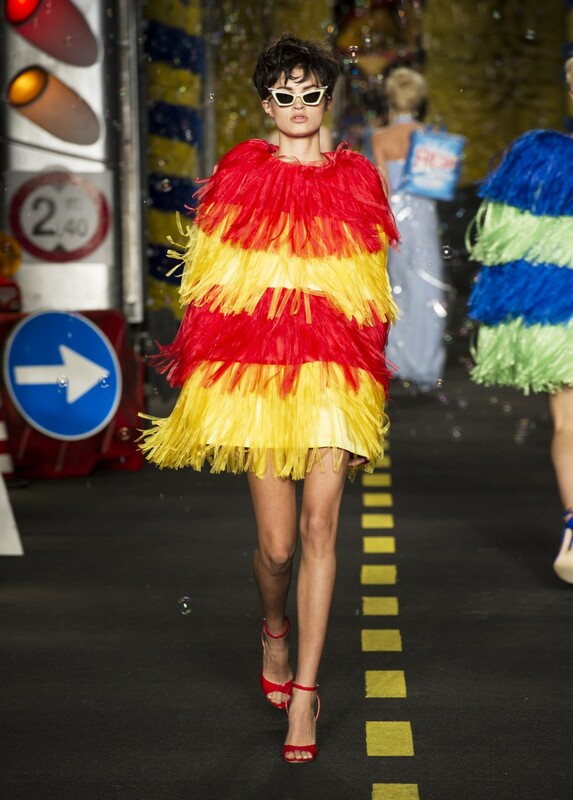 Nah, that was just DNA mod Imaan Hammam walking the runway in yellow ostrich feathers in Moschino’s never dull, under the reign of Jeremy Scott, Spring 2016 collection in a look with Anna Dello Russo’s name all over it. 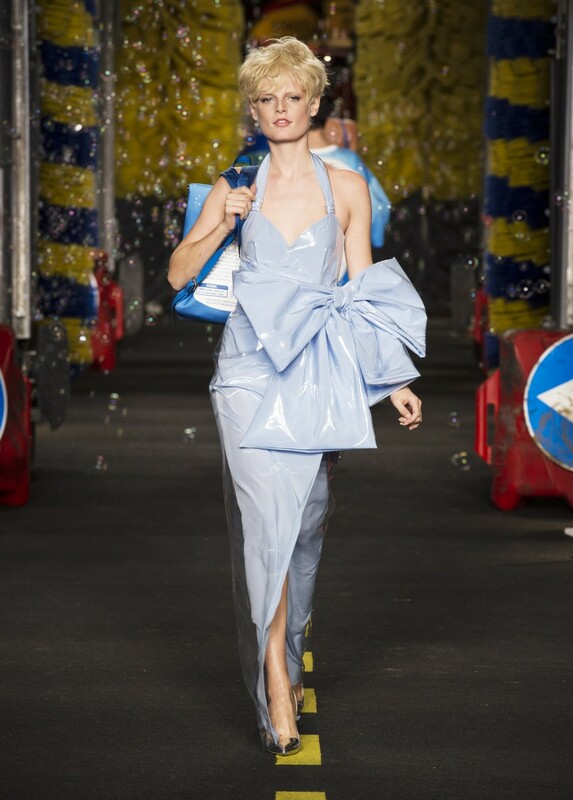 The fun didn’t stop there. 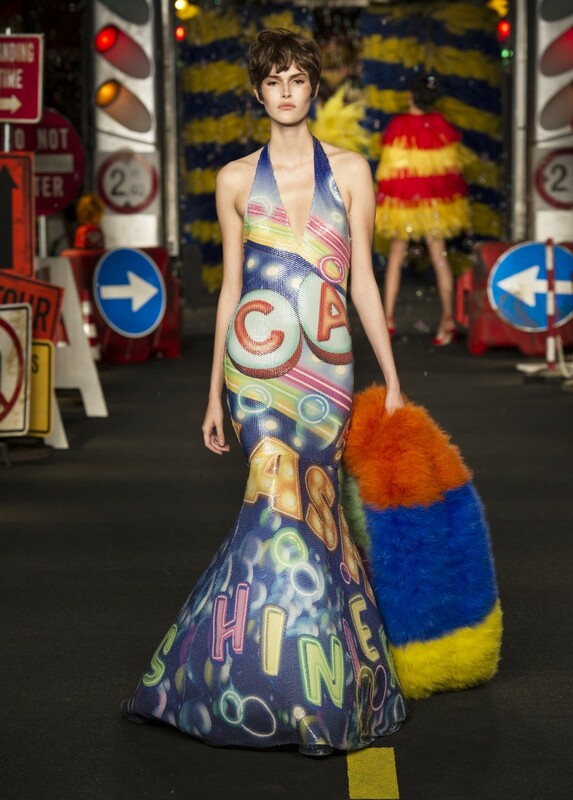 The colorful collection of 65 looks, walked by the likes of Stella Maxwell, Bella Hadid, Binx Walton, Anna Cleveland, and Molly Bair, had a wacky and welcome carwash couture theme (that’s a new one!) 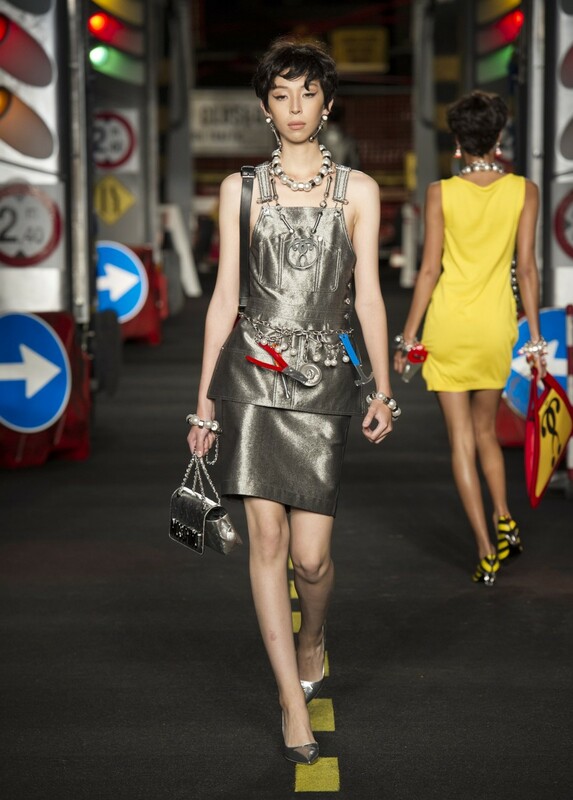 to keep pals Miley, Rihanna and Katy Perry in business. 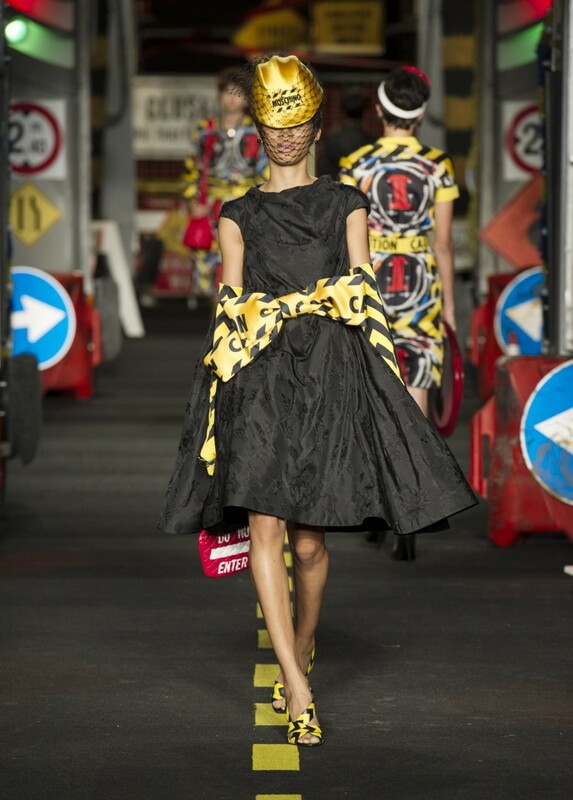 Hardhats were created by milliner Stephen Jones. 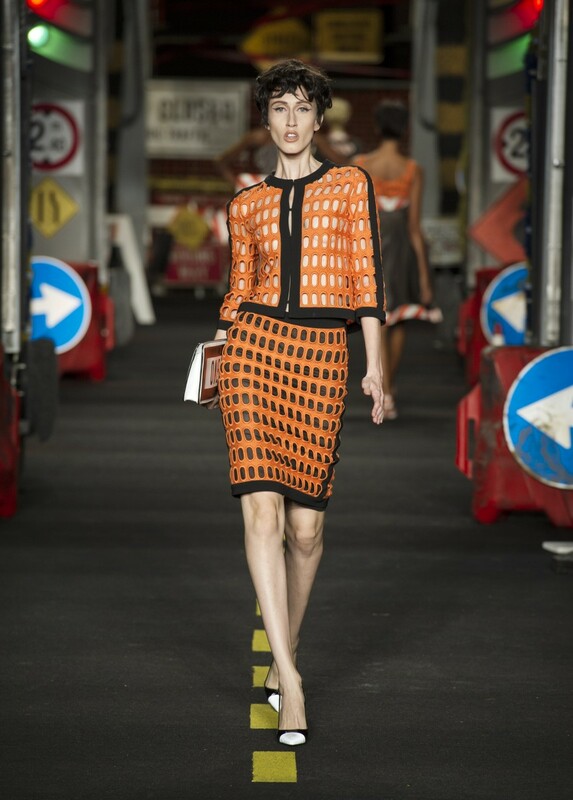 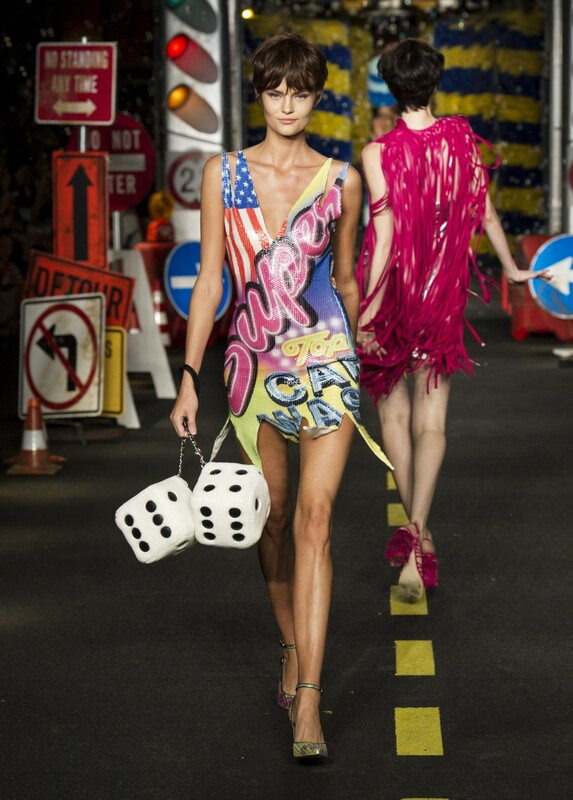 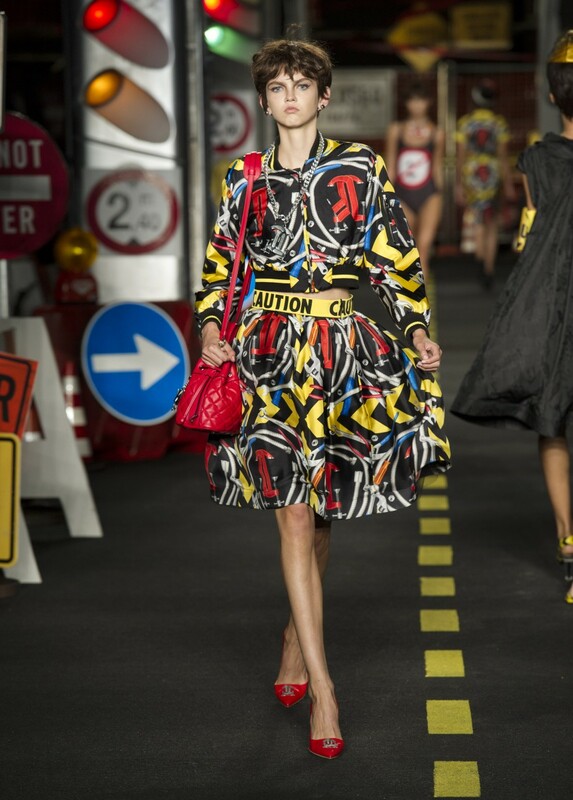 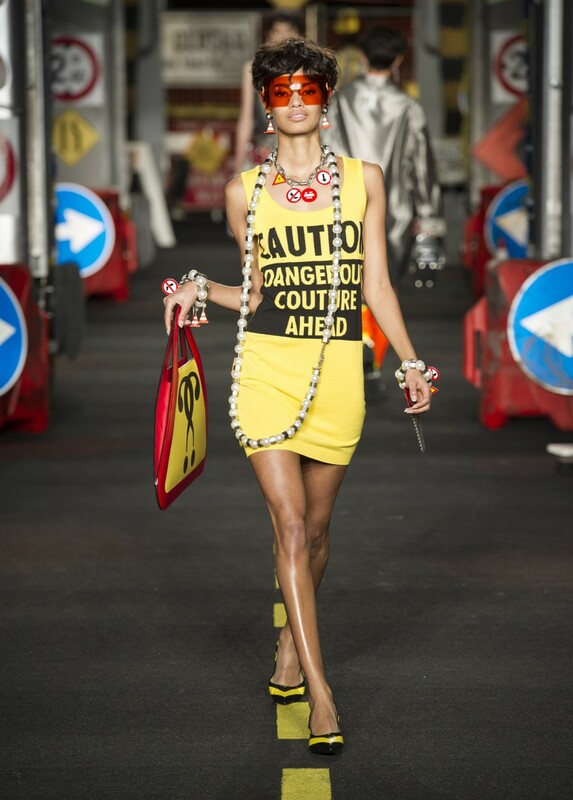 According to Moschino’s show notes the collection comes with a warning: “Drivers of fashion be aware. 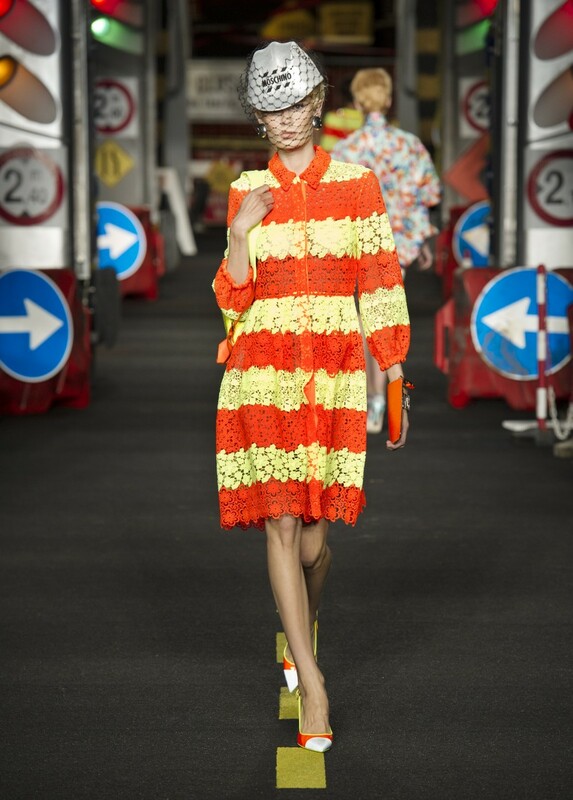 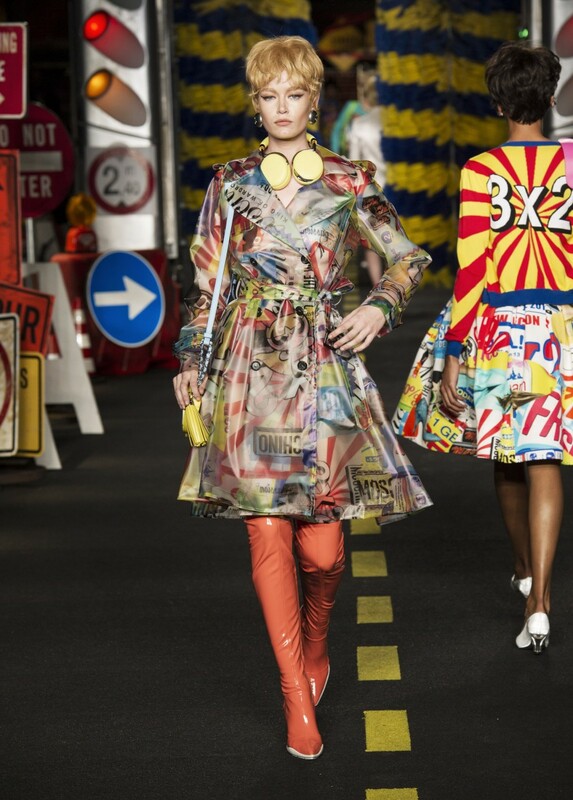 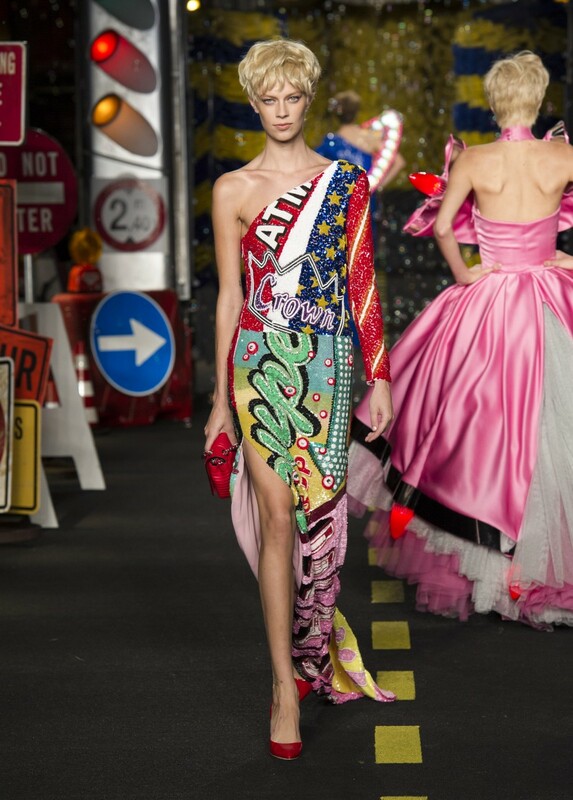 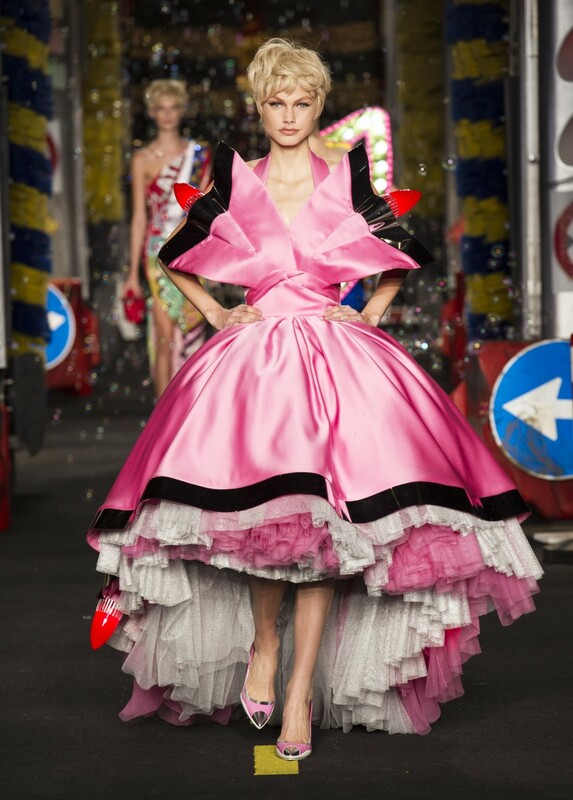 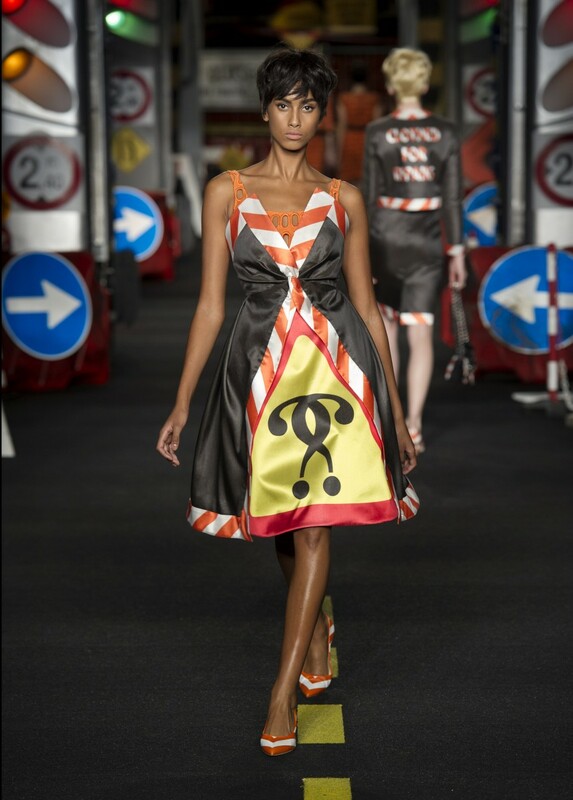 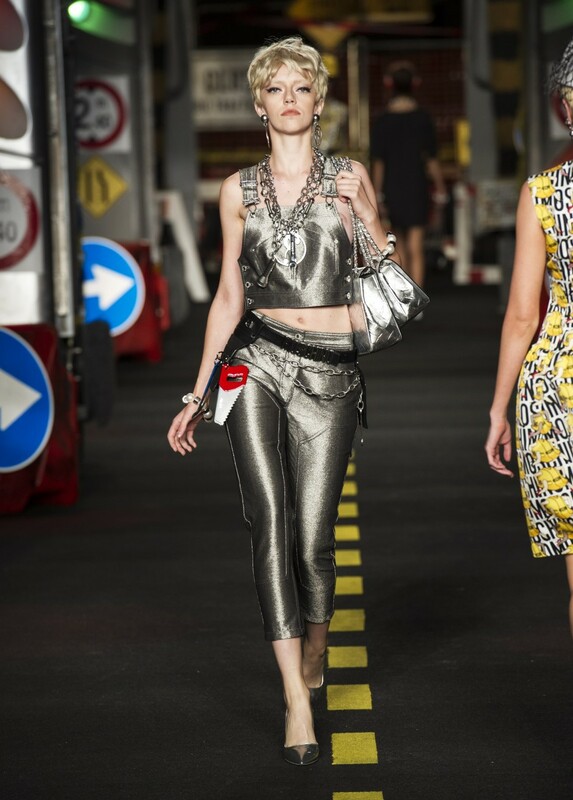 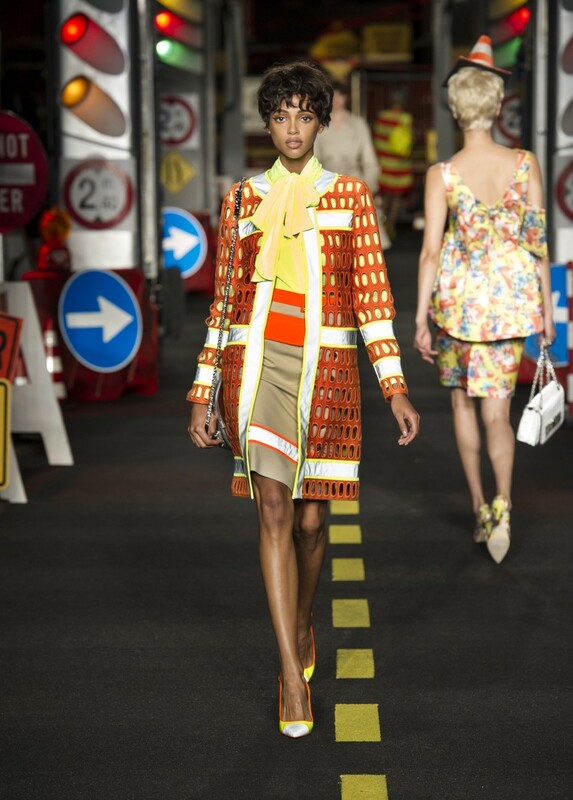 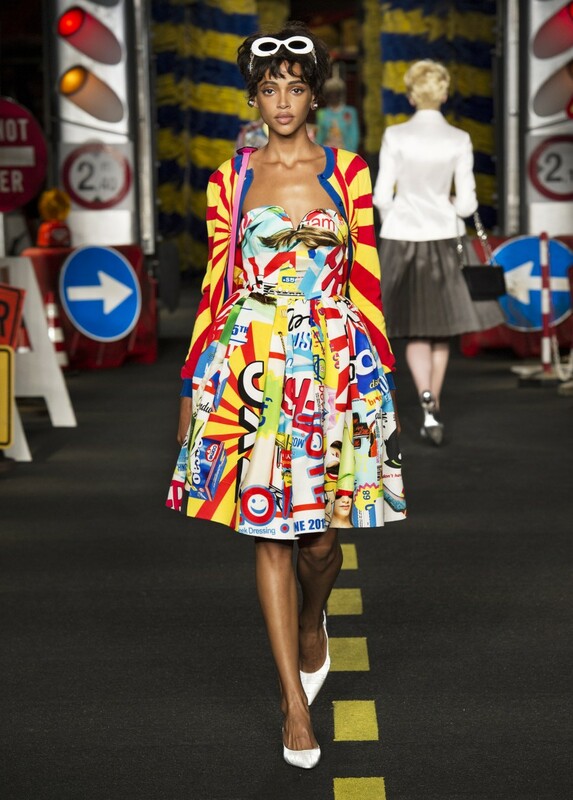 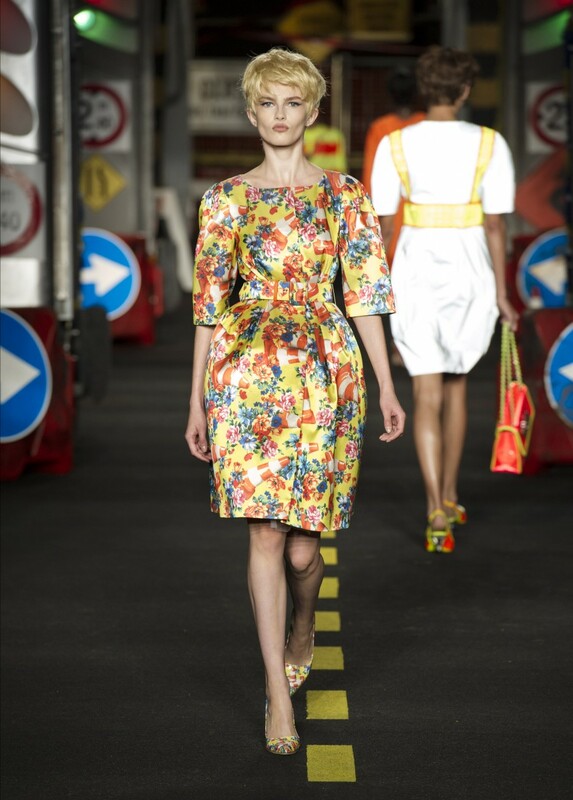 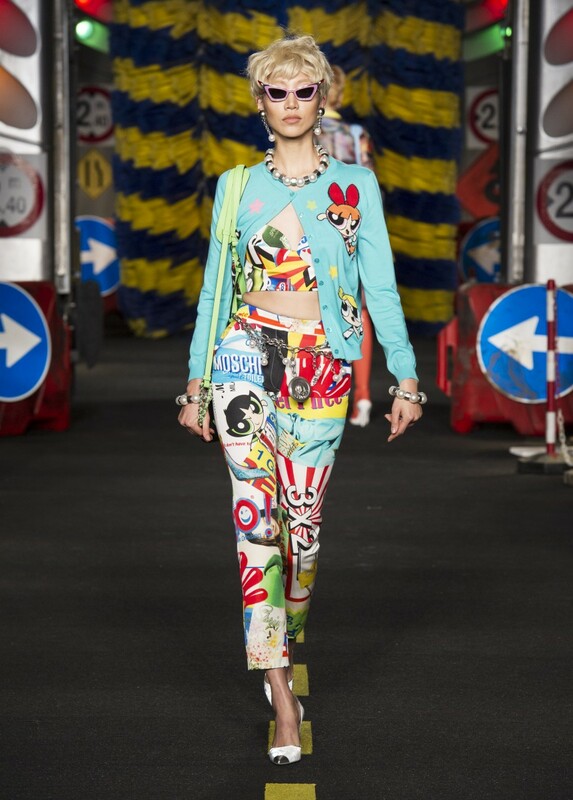 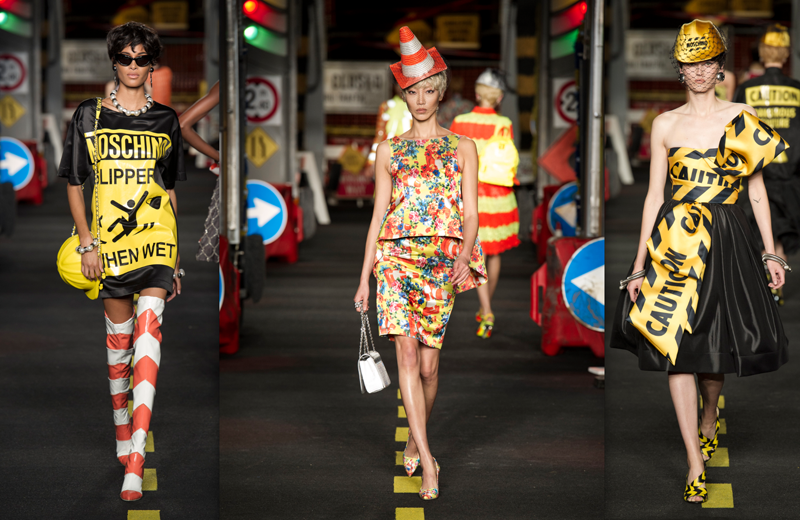 An extensive new diversion is now in force on the Moschino runway for Spring Summer 2016. 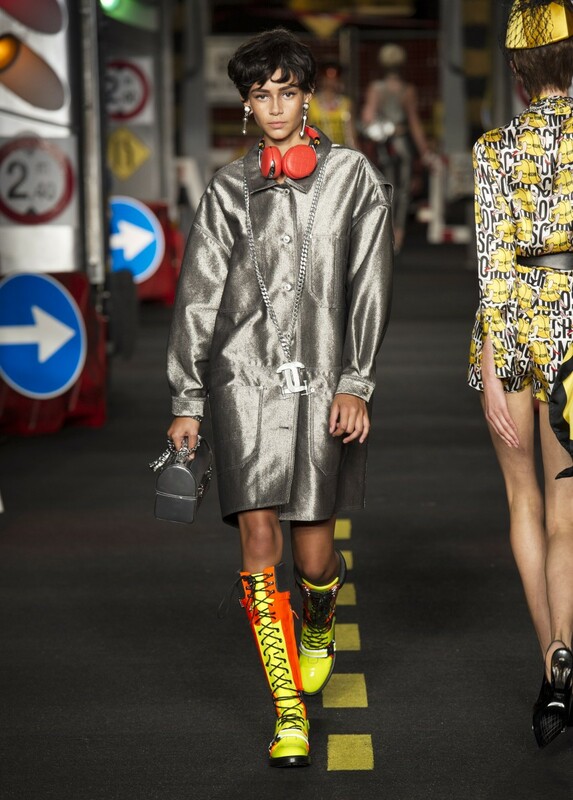 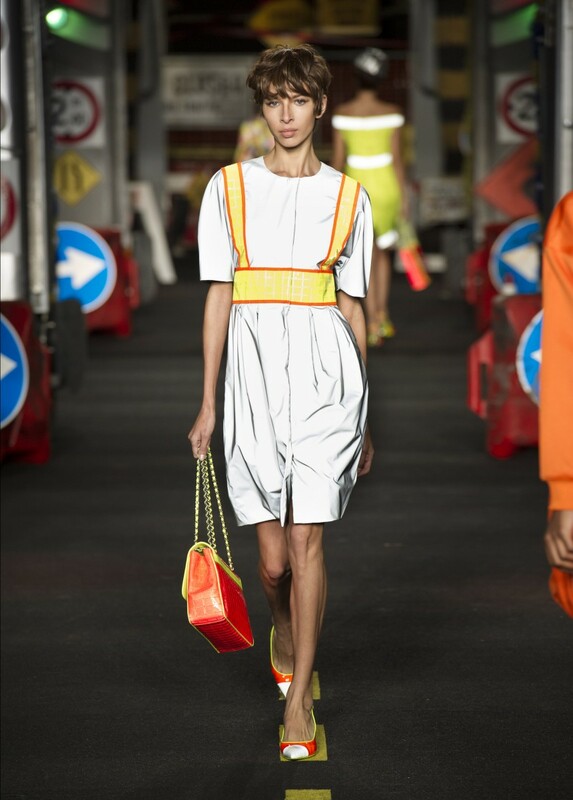 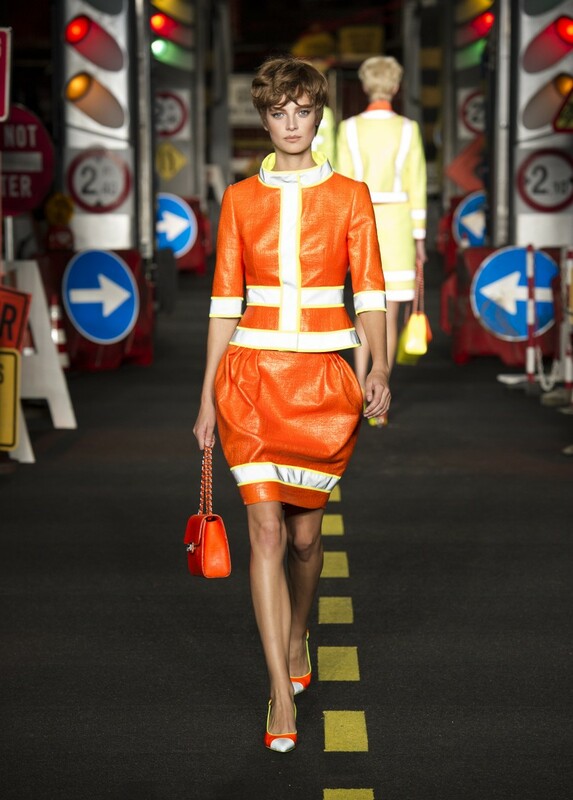 Kindly bear with us during this essential construction, brought to you by Jeremy Scott – he works so you can work it. 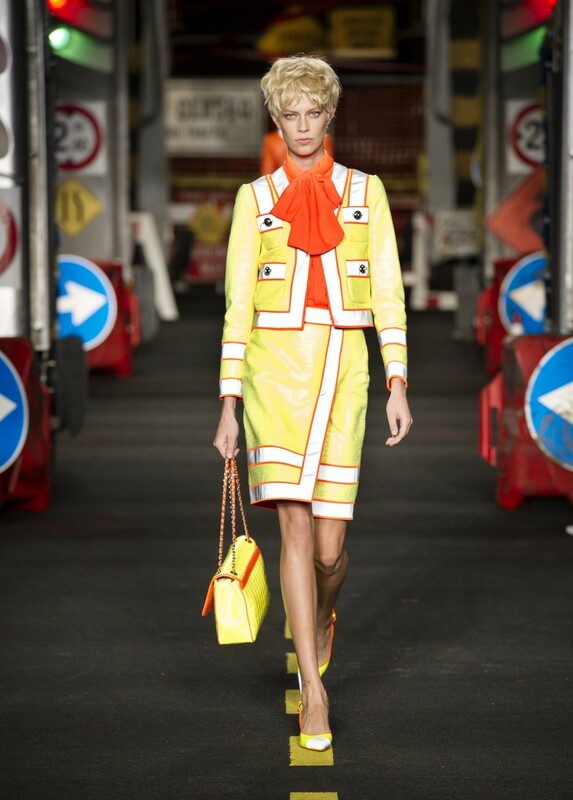 Whilst on-site, appropriate equipment will be worn. 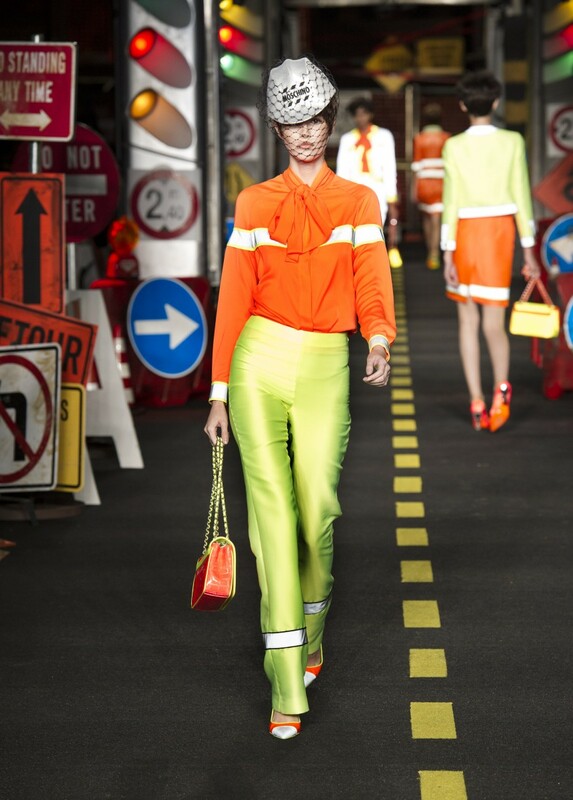 Hard hats will be issued. 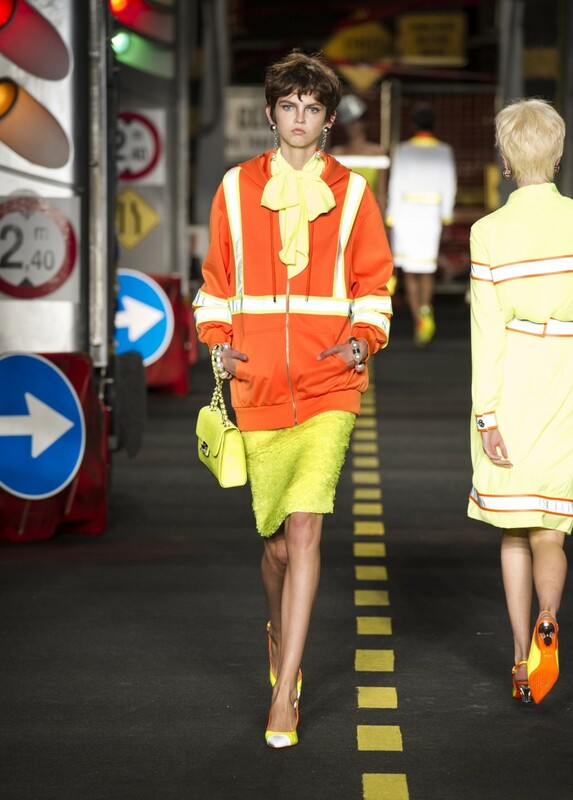 High visibility color – neon green, acid orange, reflective metallics – are for your own projection. 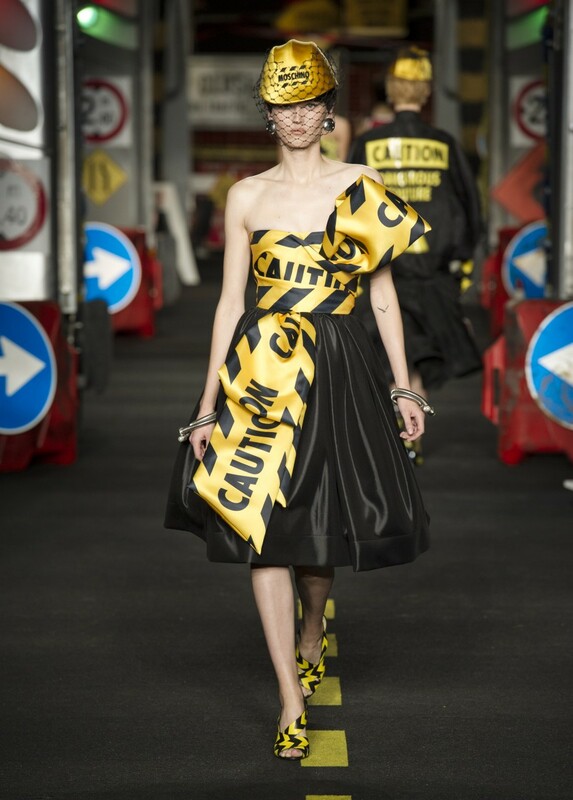 Caution tape and hazard flashes should be observed, and all signage respected. 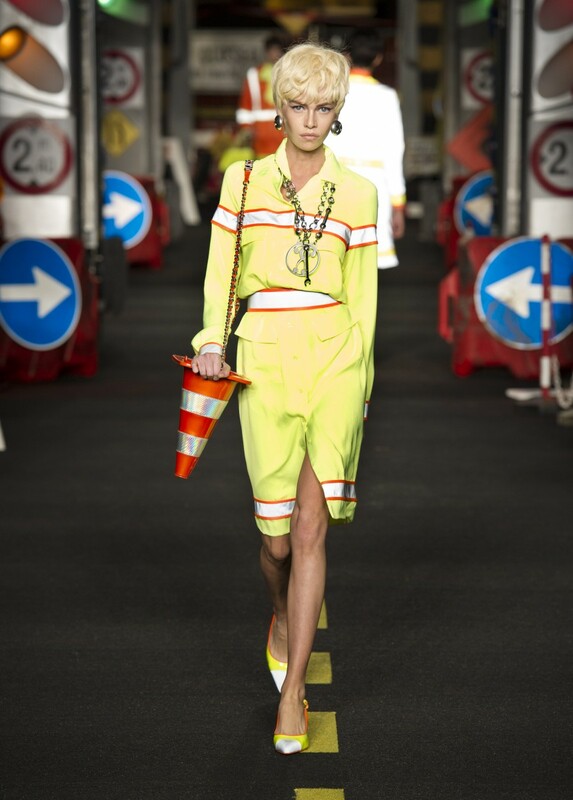 Watch out for loose tools, slick surfaces and high heels. 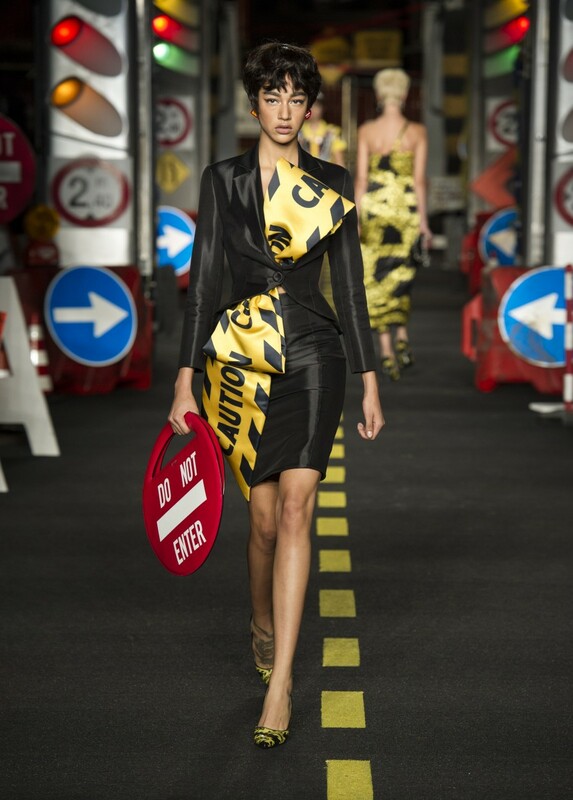 In case of accident apply Fresh – it’s a spray! 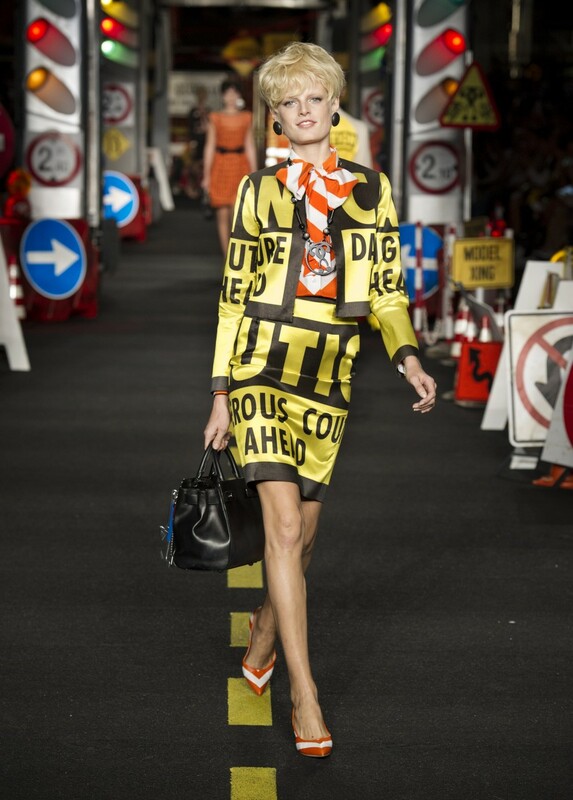 – to the affected area. 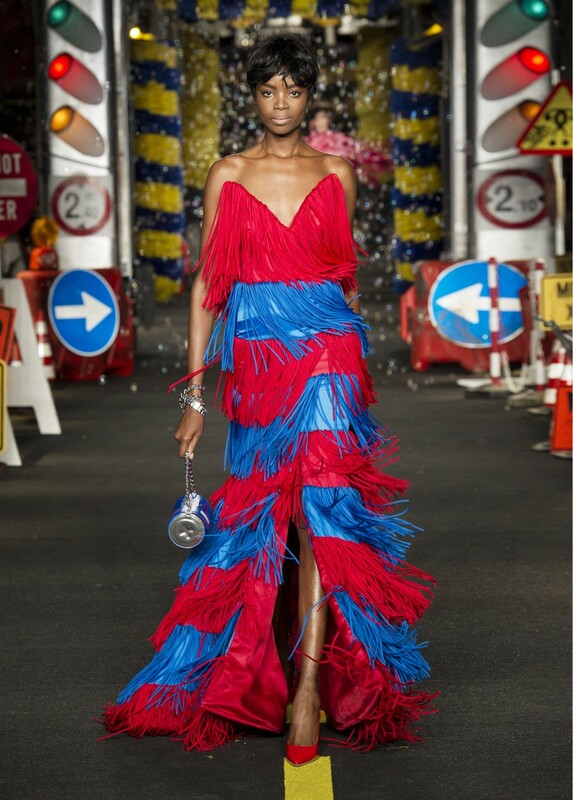 The atmosphere will instantly improve.” Scott also changed routes during the show with a slew of fifties and sixties inspired gowns for the “lady who lunches with a twist,” according to the designer. 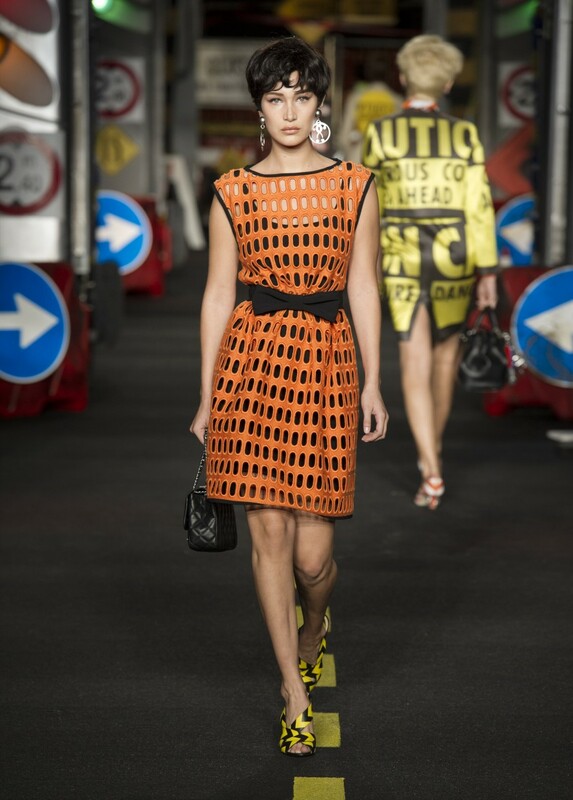 Please let us know where that restaurant is and we’re there. 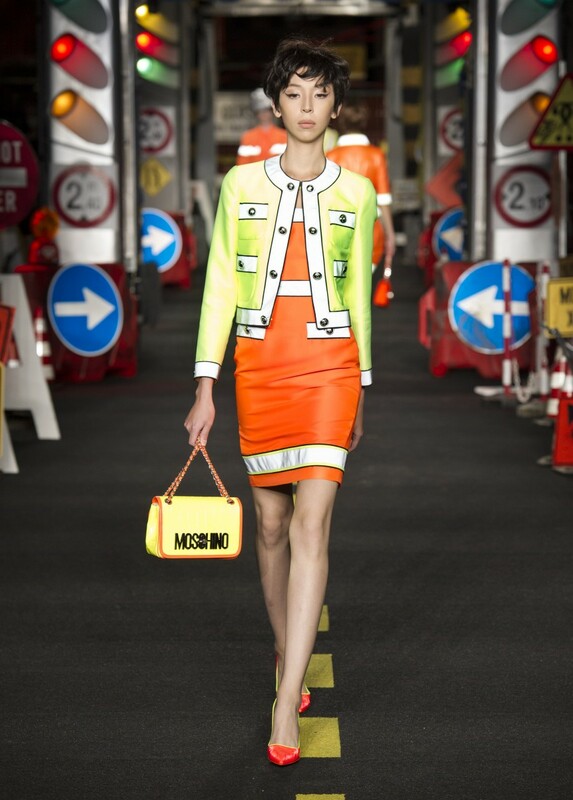 For the eager beavers, Moschino’s capsule collection is available to order online now. 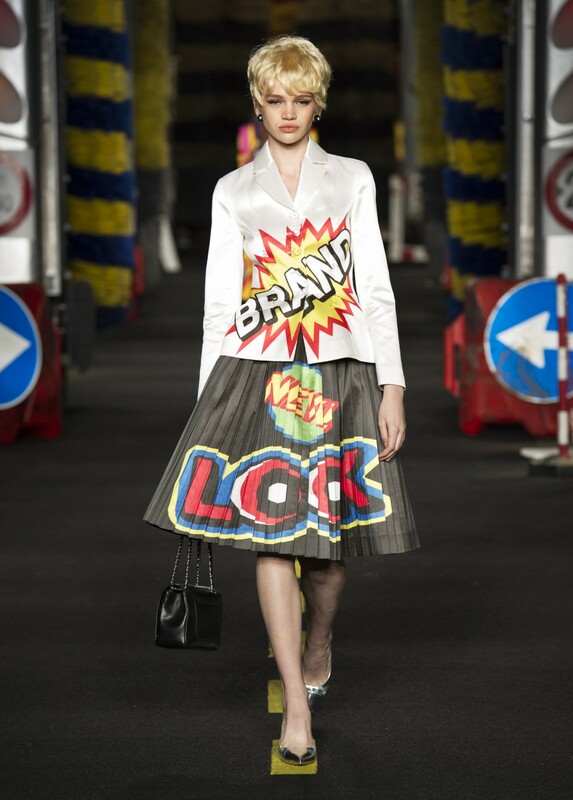 Bravo, Jeremy! 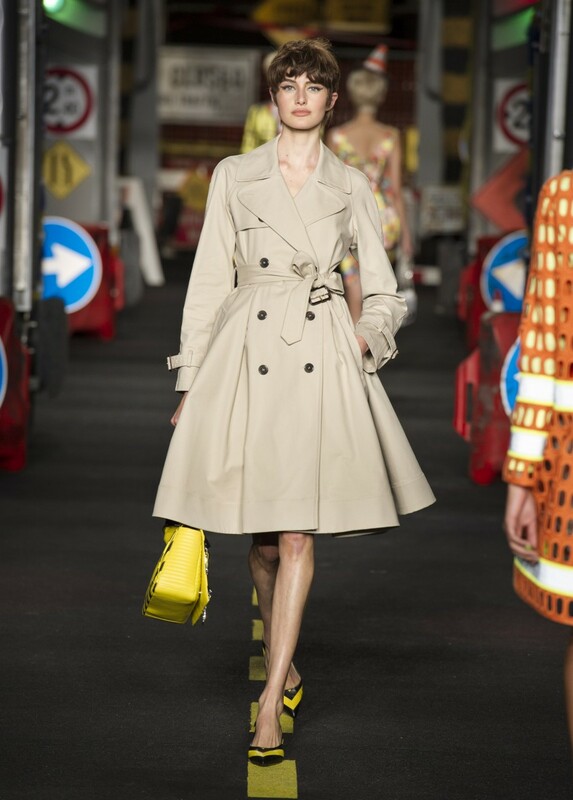 Grazie for keeping fashion fun.